Are you wondering if you should be considering a monitor mount or TV mount? The difference between between a monitor and TV is that a TV includes a tuner. Monitors are frequently used with computers, as digital displays or as digital signage at trade shows, conventions, presentations in business or commercial settings. StandsandMounts.com separates the monitor mounts from TV mounts so that you can go directly to the mounts that will work for you. If you need help choosing a monitor mount, we hope you'll give us a call at 1-800-807-1477. Our certified mounting experts and configuration specialists are ready to help. All monitor mounts ship free. Mounts for attaching your TV or monitor to pole or pipe. 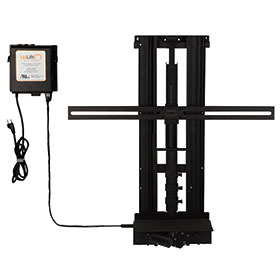 Attach your monitor or TV to a truss or pipe with a truss mounting bracket. Mount your TV under you kitchen cabinet or desk hutch with a flip down TV mount. TV Mounts for Outdoor Use. Mounts for displaying more than one TV or monitor. Multiple monitor mounts display many monitors together. Tablet mounts, iPad Stands and iPad Mounts.